Watching the tide roll in from the balcony of rustic hand crafted log abodes is the way to settle into this seaside resort in Vancouver Island. Across the expansive bay, the mountains of Whistler loom in the distance – the ones we flew over with Harbor Air in the morning after checking out of the Fairmont Chateau Whistler. An immense ferry transported us with our rental car from Horseshoe Bay to Nanaimo Departure Bay with comfortable seating, and sun deck viewing space for all. The captain announced, “There appears to be a whale far in front.” There is shopping on board as well as the Whitespot Café and work areas with device outlets in case you tire of the beautiful views crossing the sound. 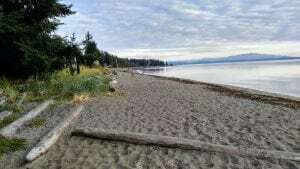 The endless beach at Tigh-Na-Mara is perfect for leisurely strolling or jogging. At low tide, beach combing is reminiscent of the salt flats in Cape Cod with little tide pools teeming with life to examine. From the bright pink sunrise to the full tide and sunset behind, this 22-acre resort manifests a peaceful, healthy lifestyle. Cedars and Arbutus (a replenishing tree) fill the grounds for shaded walks. 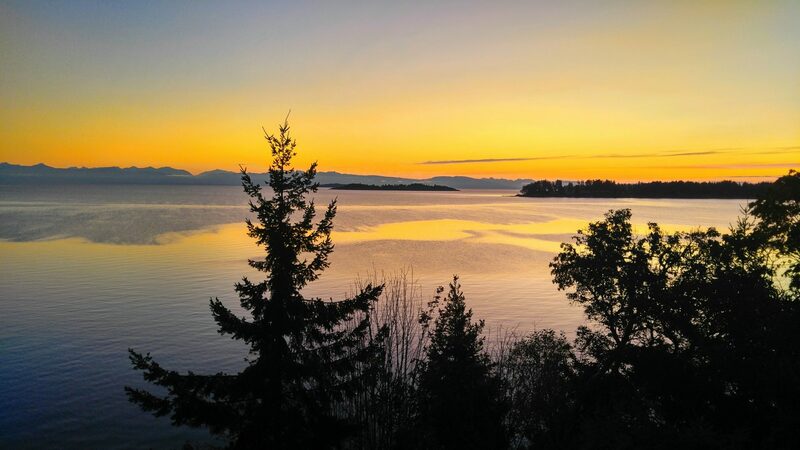 Tennis courts, a fitness room, pool, laundry facility and Cedars Restaurant and Lounge are convenient amenities at Tigh-Na-Mara where Vancouver Island’s temperate climate may be enjoyed year round. The best draw to Tigh-Na-Mara besides the beach is The Grotto Spa, number 1 in Canada and here are the reasons why. The setting is soothing the moment of entry. Water falls down walls in the halls and in the mineral poolroom where a sizeable pool has intimate and separate strategic seating to absorb the detoxifying minerals. A cool but not arctic shower is tucked into the stone wall en route to the large Jacuzzi. Alternate between them before your spa treatment, which may be selected from a full menu. The signature massage incorporates refreshing sprays, oil and hot wet towels that cocoon the face. palette and reorder whichever ones you want to repeat or call uncle if you get too full to complete the whole round and dessert will then be delivered. This is when you remember like you did five minutes ago, how lucky you are – too blessed to be stressed, filled with Grotto gratitude. If you are a spa lover, you gotta go to Grotto. fringe of the tenth green. Swans gracefully skimmed the water of multiple ponds. 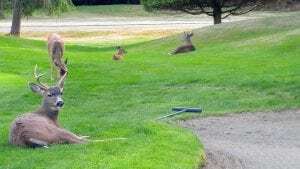 A few decoys are placed to keep golfers guessing whether it is fake or real fowl. Les Furber designed a lot of character into the course set amongst timbers and rolling hills with ocean views. Joined by Jeff Dinn, the Fairwinds course was better than fair, it was excellent and the wind didn’t come into play. Cuisine at golf clubs throughout British Columbia surprised us with selections and Fairwinds Bar and Grill was no exception. The chef prepares daily specials from locally sourced ingredients. Members, visiting golfers and locals flock to the Grill for apps, personal pizzas and full dinners. It’s all part of Super Natural British Columbia.